New Featured Interview at Sweet & Twisted Thoughts With A Ghoul’s Best Friend! Sweet & Twisted Thoughts by A Ghoul’s Best Friend!!! Please visit the page and leave some comment love about me, my art and all things Living Dead Girl Nicole! To see some more various sites my art has been featured at go to my Caught Red Handed Page!! 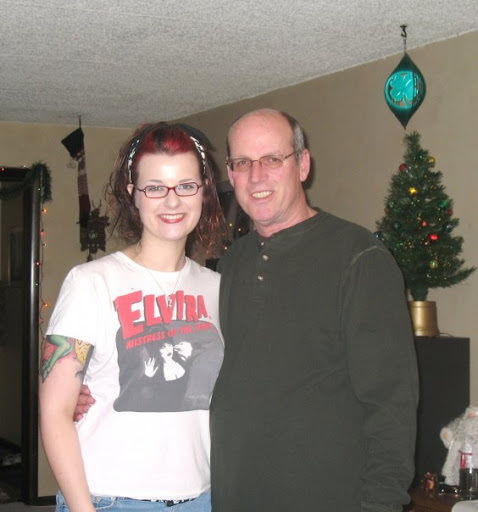 From either knowing me personally, reading things on my art site like my About the Dead Girl info page many of you know that my Dad has been a huge artistic influence for me. Growing up my Dad would teach me how to shade and add uniqueness to my artwork. When other kids were coloring with Crayons I knew what Prisma Colors were. I blame my Dad for when I was little and actually turned down Crayola Colored pencils in art class because I had to use Prisma Colors ha ha. I am not a snoody person by any means and neither is he. It’s just when you’re an artist if you find something that works good you stick with it. And he taught me to appreciate the good stuff. I did however still love my crayons and would organize them by color so that I could find them when I needed them. If there was one thing I took care of as a child it was my art supplies. I could have had the messiest room in the world but my crayons were organized even by color ha ha. I have always had a passion for the arts and having an artistic Dad made it that much more interesting to me. I have always been amazed by his talent. I remember going to the movies to see the Little Mermaid and him coming home and drawing the characters for me from memory. When I had big art contests to enter or big art projects in school my Dad enjoyed helping me out. Giving me creative lead and giving me input along the way. He would even pull out his good art supplies and let me use them. Not only did he influence me to continue doing art but I knew that he believed in me. When my Dad gave me my “1st Portfolio” this past Christmas it was a physical reminder of that. When I brought it into work the woman there were in awe that a Father would keep so many things their child made. One of my co-workers said “Just looking at this I can see how much he really believed in your art. He knew you were talented even back then.” Seeing she has never met my Dad but could see this just by looking at the book made it that more special to me. During various times of my childhood I was “lost” and had to grow up very quickly without much of a choice, but having someone believe in me made me that much stronger of a person. And I thank my Dad for being one of those people in my life. Today is my Dad’s birthday and I wanted to dedicate this “art” post to him. For everything he did to influence me as an artist and as a person. For always believing in me and always allowing me to be myself without question (no matter how weird I was to others ha ha ha). Well with Halloween this weekend.. we had the option of dressing up at the office today. 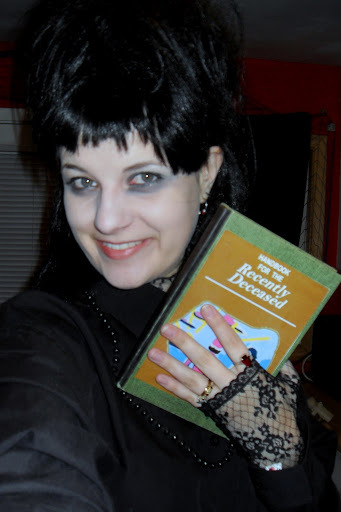 Money being tight I decided to pull my costume out from last year from when I dressed as Lydia Deetz (despite the wig it’s also really comfy) . Last year I didn’t dress up at work cause I had wedding on the brain.. I only wore it for a party so my co-workers have never seen it. I didn’t enter the costume contest at work although I wish I had… cause the person who came in 3rd was dressed as Beetlejuice ha ha. But everyone at work loved it and it got me even more in the Halloween spirit for this weekend!! Unfortunately my Count Pumpkin took 2nd place in the pumpkin decorating contest. I was grateful to take 2nd place despite the 1st place winner using an idea that has been plastered all over the internet for years. Everyone kept telling me all day how mine should have won because it was original. So that was nice to hear. 2nd place still landed me a $35 gift card to Buffalo Wild Wings though! So me and the hubby will be grubbing sometime this weekend to celebrate. I have always been a Halloween freak. I have so many awesome memories of my Mom and her best friend Jackie dressing me up in fun costumes. The best part is I always had a part in picking out what I wanted to be.. who I wanted to be and loved every minute of it. My Dad use to take part in the Halloween fun as well. He would get into Halloween and dress up as characters and sit out side on his front porch for the trick or treaters. One of my faves he did was actually Beetlejuice. He even dressed as McDonald’s Mac Tonight and got on his roof and danced and sang for the trick or treaters. He also use to take me to Boo at the Zoo every year as well. As I have gotten older Halloween “time” has become more and more special to me. 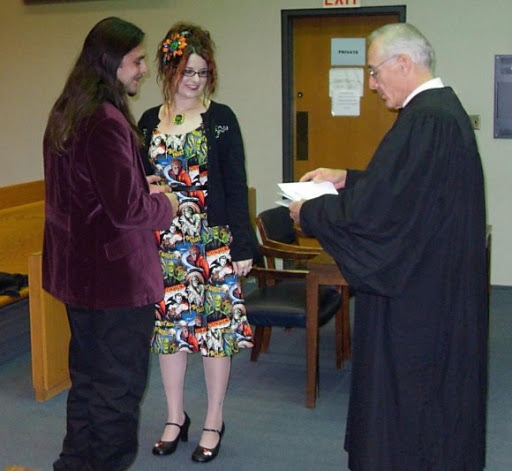 Sunday is not only Halloween but mine and my husband Frank’s 1 year wedding anniversary!! Last weekend marked 12 years from our 1st date 🙂 which was our Homecoming dance our senior year of high school. Our 2nd date was Fright Fest at Great America haha. Next Sunday on 11/7 we mark the official 12 years of being an official couple! Ever since I was a little kid I have just loved this time of year!! Which of course makes it even more awesome that me and my husband started to date during this time of year. It was like it was meant to be. And getting married on Halloween last year was unforgettable and couldn’t have been more “us”. Every year when fall comes around and the leaves start changing I have so many wonderful memories to look back on and so many to continue to look forward to. On top of everything it has also inspired me in my art work as well!! So when you look at my art pieces remember the artist is that little girl who obsessed over Halloween and never let it go! ha ha! As mentioned on my websites over the years and including this one.. one of my biggest inspirations to do my artwork is my Dad (Tom Birmingham). Growing up when most little kids were coloring.. my Dad would help teach me how to shade….teach me how to make my school projects stand out from the rest… and buy me art supplies I never heard of! And most importantly no matter how “weird” I am my Dad has always supported me.. not only with my art but also as a person. My Dad being an amazing artist has had his art work featured in everything from newspapers, greeting cards and on the desks and homes of big name business owners! And now to add to the list his artwork is now featured on the Route 66 Soda Pop bottles!!!! How freaking cool is that!!! I had to take the opprotunity to use my site to give my Dad a shout out for this because I think it’s so fun and awesome!! Check out the bottles, the art and video HERE! !